Motherwell won at Celtic Park for the first time in nearly eight years, coming from behind to do so. 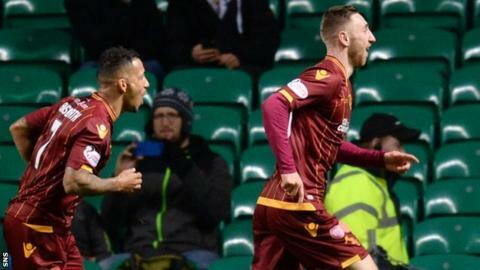 Louis Moult's double turned the game around after Nir Bitton's deflected shot had given the champions the lead. It means Celtic have failed to win at home in their last four games, the first time that has happened since Tony Mowbray was manager. They remain a point clear of Aberdeen at the top of the league, while Well's revival under Mark McGhee continues. The match was prefaced by an emotional unveiling of a statue of Celtic's legendary European Cup-winning captain, Billy McNeill. The thousands of supporters who gathered for the occasion would have been underwhelmed by what unfolded inside the stadium in the opening 45 minutes. Their team dominated possession but found Motherwell to be well organised and therefore difficult to penetrate. But the chess-like approach to the first half could not have been in greater contrast to the action-packed second period. Lionel Ainsworth should have put Motherwell ahead, but his chip over goalkeeper Craig Gordon also cleared the crossbar. It looked like Motherwell would pay a hefty price for that as Tom Rogic burst clear, squared for Bitton and the midfielder's shot took a big deflection off Keith Lasley on its way past goalkeeper Connor Ripley. However, Marvin Johnson, whose pace had already caused Celtic problems, soon fired the ball across goal for Moult to tap into the net. And the game was turned on its head when Scott McDonald's sharp turn enticed Jozo Simunovic into a rash challenge. It gave Moult the opportunity to double his and Motherwell's tally, which he duly took, rolling the penalty straight down the middle as Gordon dived to his left. They could have gone further ahead but for Gordon, who rushed off his line to block from McDonald after Dedryck Boyata got into trouble and then used his left foot to deny Moult a hat-trick. In between those efforts, Bitton had a shot blocked on the line and Ripley saved from Scott Allan and Kris Commons. Celtic piled forward in the closing stages but failed to create any further openings as Motherwell celebrated a hard-earned victory. Match ends, Celtic 1, Motherwell 2. Second Half ends, Celtic 1, Motherwell 2. Corner, Celtic. Conceded by Luke Watt. Scott Allan (Celtic) wins a free kick in the defensive half. Ben Hall (Motherwell) wins a free kick in the defensive half. Attempt missed. Jozo Simunovic (Celtic) right footed shot from outside the box misses to the right. Substitution, Motherwell. Luke Watt replaces Lionel Ainsworth. Attempt saved. Marvin Johnson (Motherwell) right footed shot from the centre of the box is saved in the centre of the goal. Corner, Celtic. Conceded by Connor Ripley. Attempt saved. Kris Commons (Celtic) right footed shot from outside the box is saved in the top right corner. Substitution, Motherwell. Louis Laing replaces Stephen McManus because of an injury. Delay in match Stephen McManus (Motherwell) because of an injury. Substitution, Celtic. Carlton Cole replaces Tomas Rogic. Attempt missed. Lionel Ainsworth (Motherwell) left footed shot from outside the box is just a bit too high from a direct free kick. Attempt saved. Scott Allan (Celtic) header from the left side of the six yard box is saved in the top centre of the goal. Attempt blocked. Nir Bitton (Celtic) left footed shot from the right side of the six yard box is blocked. Corner, Celtic. Conceded by Marvin Johnson. Substitution, Celtic. Scott Allan replaces James Forrest. Attempt missed. Louis Moult (Motherwell) right footed shot from the centre of the box is too high. Attempt saved. Scott McDonald (Motherwell) right footed shot from the centre of the box is saved in the bottom right corner. Attempt missed. Stephen McManus (Motherwell) header from a difficult angle on the right misses to the right.